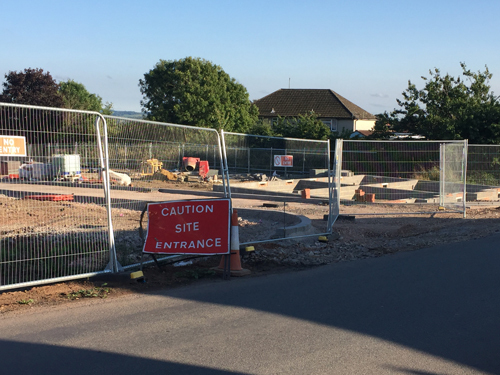 WORK is forging ahead on a new estate in Greenbank Road in Hanham. Bellway Homes is building 77 two, three and four bed homes on open space between Aek-Boco Football Club and The Church of the Ascension. The plans include two separate accesses onto Greenbank Road, 129 private parking spaces, with 43 garage parking spaces and 16 spaces for visitors. Improvements will be made to the children’s play area south of the site. A highway improvement scheme for Greenbank Road is included and will provide facilities for pedestrians and traffic management measures to remove existing bottlenecks and reduce vehicle speeds. Residents expressed a mixed reaction to the plans with some in favour and others objecting, saying it will attract extra traffic onto an already busy road. Hanham Parish Council and eight residents lodged formal objections to the plans.